They also only require a few supplies, and you don’t really need any serious crafting skills to pull them off either. 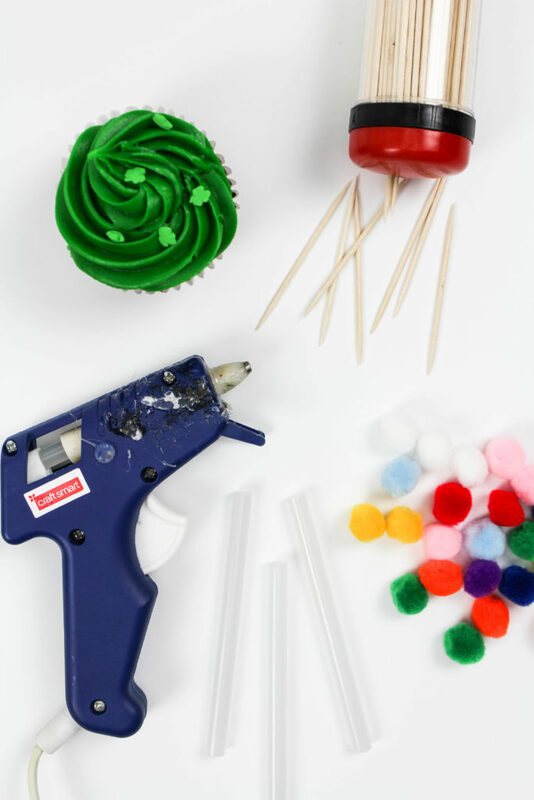 Just a little help from your trusty glue gun! Each topper only takes about 5 minutes to put together too! 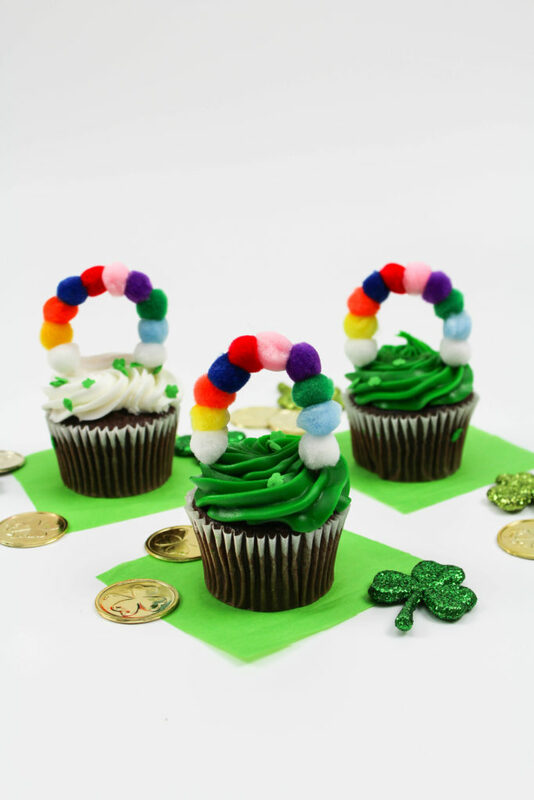 So you can whip up a bunch for a fun classroom party, birthday treat, St. Patricks Day get together, or just to enjoy for yourself! First, plug in your glue gun and allow it to heat up. 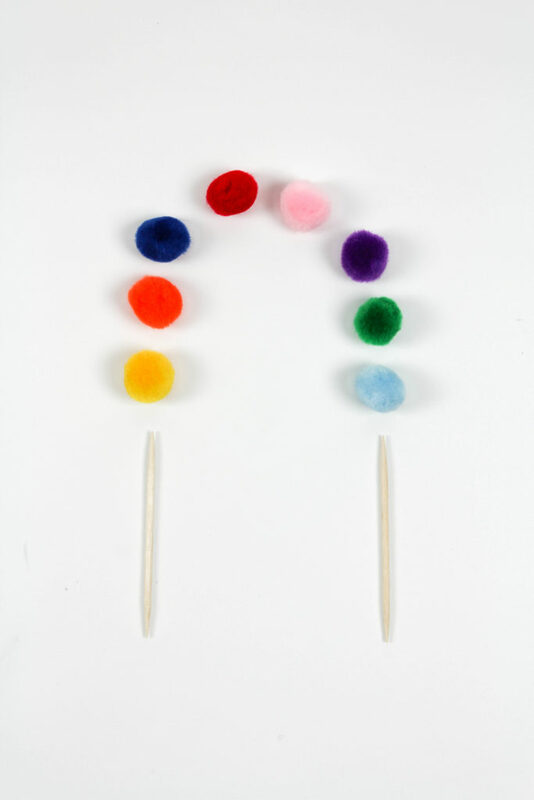 Next, start laying out your pom poms in the order that you’re going to want them to be in your finished “rainbow”. 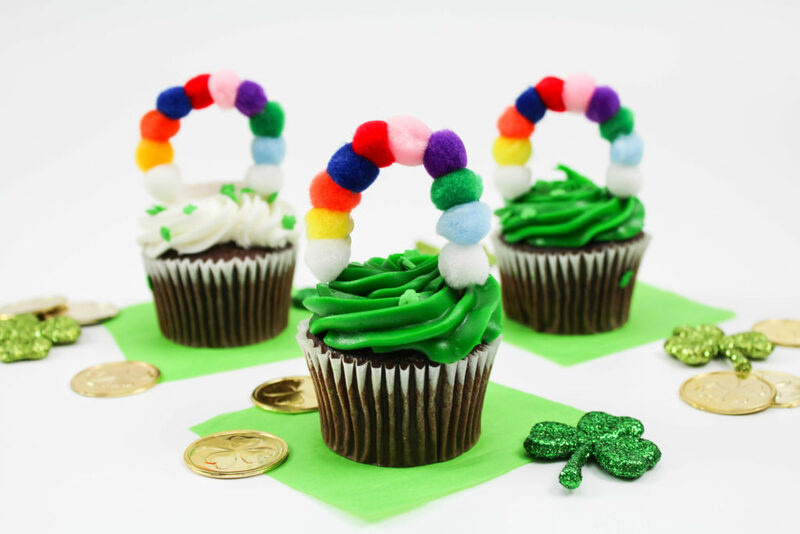 The toothpicks will be the “feet” that keep your topper in place in your cupcake, so using your glue gun, begin gluing your first pom pom to the front and top of one of your toothpicks. Next, glue your next pom pom color onto the top of your first pom pom. 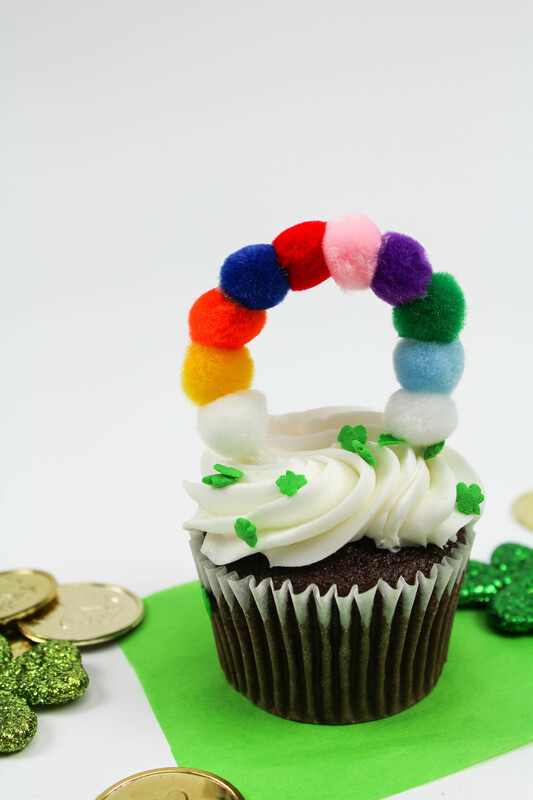 Repeat the process, gluing each pom pom onto the previous one, and bending them slightly as you go around, to create a half circle, or a rainbow shape. When you get to the last pom pom, attach it to your other toothpick, again to the front and top. This will now secure your entire strand to the first toothpick. Once all of your pom poms are attached to the toothpicks, add one white pom pom to the bottom of the first pom pom on either side. These will be your “clouds”. Make sure you don’t have any glue strands sticking to your toppers before inserting them into your cupcakes. Then just pop the toothpicks into the top of your cupcakes and serve! 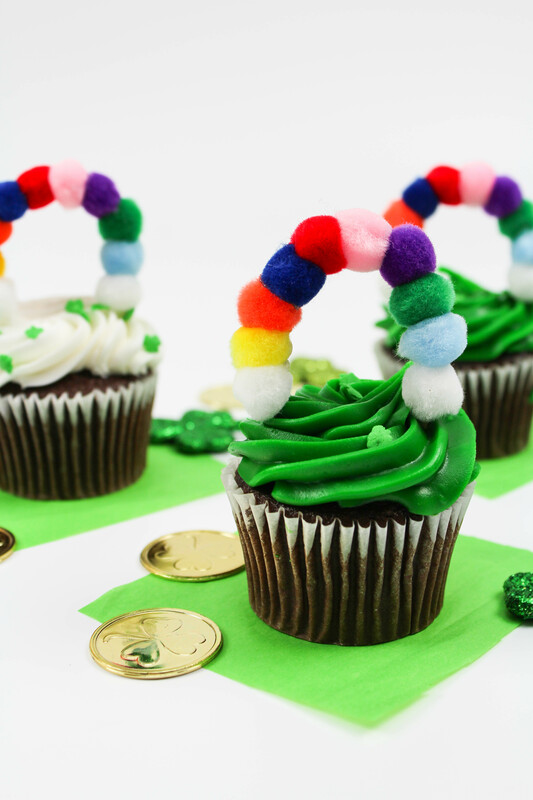 These DIY St. Patricks Day rainbow cupcake toppers are definitely an easy project, but super cute! And equally as fun too! 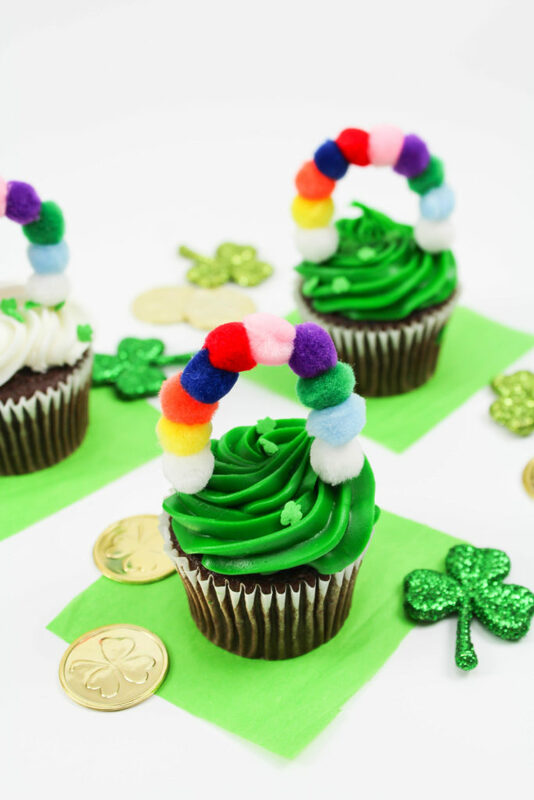 How cute is this rainbow DIY!